Hi, this is all new to me, can I use just the black ink cartridge without the colour one or must I buy both for the copier to work as both inks have finished? My son gave me this copier as I'm a bit old to understand what I need to buy. Thank you for your help, Maria. It's likely that because the Kodak ESP C310 is a colour inkjet printer, you'll need to have both the black Kodak 30 / 30XL and the colour Kodak 30 ink cartridges installed with remaining ink in each cartridge for the printer to work. For further instructions and help with mono print settings please refer to your Kodak ESPC310 printer manual. Hi, can you guarantee that the non-Kodak branded cartridges will work in my Kodak ESP 310 printer? In the past, I've bought non-Kodak ESP C310 cartridges only to find that they don't work? Kind regards, K Smith. I've just bought a Kodak 30CL cartridge from a shop but on getting home I found they've sold me a 10C colour one by mistake? Will this be okay? Unfortunately not. The Kodak ESP C310 printer can only use a Kodak 30CL colour ink cartridge, The Kodak 10C colour cartridge isn't compatible with this printer or any other printers that uses Kodak 30 series ink cartridges so you wouldn't be able to use the cartridge you've been sold. We advise you to check with the retailer to see what their returns policy is. If they're unable to provide you with the cartridge you need we have the Kodak 30CL colour cartridge in stock and available to buy with free next day delivery. Can I refill my ESP C310 printer with two black ink cartridges? Is VAT paid separately for Kodak ESPC310 cartridges? Your order total should include VAT. However, we list our Kodak ESP C310 ink prices both inclusive and exclusive of VAT. The figure quoted in red font beside the product you're viewing is excluding VAT. The figure quoted in grey font in brackets includes VAT. How can I replace the ink cartridge in my Kodak ESPC310 printer? I've tried compatible inks in my Kodak ESP C310 in the past and the printer would not accept them. Can you offer a guarantee that they will work if I purchase them from you? Yes, provided that you order the correct cartridge for use within your machine and your printer is a UK model then the compatible Kodak ESP C310 ink cartridges that we supply are covered by a 30 day money back guarantee. There's no reason why they would not work well for you. In the unlikely event you do encounter any problems, we'll replace or refund the unsatisfactory item. I have a Kodak ESPC310 printer. It says the cartridge is a 30 black or 30 colour. Will the 30CL be the same? If not, which is the correct cartridge on your site for my printer? Thanks. Yes, the Kodak '30CL' and is short for Kodak '30 colour' cartridge so this is the correct ink for your printer. All of the items we list on this page are compatible with the Kodak ESP C310 printer. If you're uncertain about cartridge codes please click on the item you're interested in and scroll down the page until you reach our 'Product Specification'. The 'Manufacturer Part No.' field will confirm the part numbers of the cartridge you're viewing. Are there compatible colour cartridges on offer for the ESP C310 printer? Have you compatible cartridges for my Kodak ESP C310 printer? Yes, the compatible Kodak ESP C310 inkjet cartridges are shown above. They're listed under ' Premium brand recycled ink cartridges' and are the items which aren't pictured in official Kodak packaging (yellow branded boxes). I usually buy my ink through another supplier directly as there's no postage charge to Spain because I order other things from there as well. They don't have Kodak ESP C310 inks in stock at the moment, so was wondering if you offer free or very cheap postage to Spain? Thanks. Unfortunately, we do not dispatch outside of the UK. Can I use Kodak 10B and 10C ink cartridges in my Kodak ESP C310 printer? No, the Kodak 10 ink cartridges are not compatible with the Kodak ESP C310 printer. You must use the Kodak 30 range of inks as listed above. I have a Kodak ESP C310 printer. Quality of print is not good and, after replacing the black ink cartridge, I have been advised that I need a new printhead. However, none of the Kodak suppliers around (Fareham Hants) stock a printhead. Also they don't seem to appear in the online direct page. Can you help - I think I should have 2 as the first one has lasted only as long as the ink cartridge? Thanks, Stuart Macdonald. We do not sell a printhead for use within the Kodak ESP C310. I suggest contacting Kodak directly as they might be able to supply you with a new printhead. Do you stock combo packs for the Kodak ESP C310 that contain a colour cartridge? We do stock multipacks for the ESP C310 printer that contain a combination of black and colour ink. To see our sets of ink cartridges for the Kodak ESP C310 inkjet printer please return to the top of this page. The ESP C310 multipacks are listed first. Does this Kodak ESPC310 printer ink dry up once it's being used? If so, how long is the expected life? Thank you. The ink may start to dry up if the printer isn't used for a long period of time. I would recommend printing a page at least once every couple of weeks to stop this from happening. Is there a compatible ink cartridge for Kodak C310? Kodak do a pack containng 1 x 30XL black cartridge and 1 x 30CL colour cartridge. Are you able to supply them and for what price per pack? Many thanks, Roger Moore. Designed for heavy-use homes, the Kodak ESP C310 is one of the cheapest all-in-one printers to run. 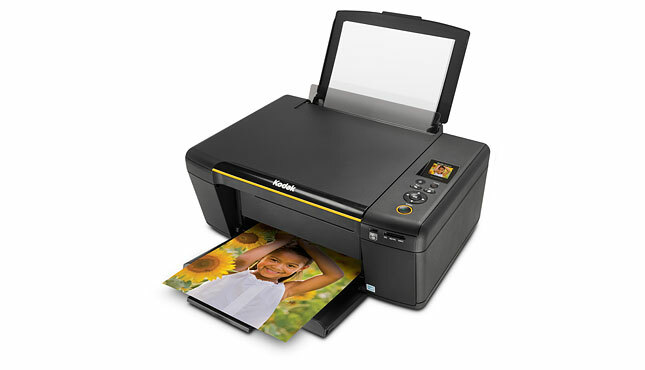 It offers Wi-Fi connectivity and produces good quality prints, scans, and copies. Though the Kodak ESP C310 is cheap to run, the initial cost is a bit pricey. It lacks a fax machine. Printing and copying speeds are slow, too. The Kodak ESP C310 all-in-one printer is a bit chunky. It has a black plastic exterior with an optical scanner, plus an organised control panel on top of the printer along with a 1.5 inch colour LCD. A PictBridge socket and memory card readers are built into the Kodak C310 printer. Built for workgroups, this inket multifunction printer is very easy to use and to share. It has Wi-Fi connectivity for easy networking. The Kodak ESPC310 can even function without a computer, thanks to the LCD display where previewing and selection of print jobs can be done. Printing directly from a camera and memory cards is easy with the PictBridge and the memory card slots. The ESP C310 is cheap to maintain and run. The LCD display is very tiny and hardly useful. The Kodak ESP-C310 lacks a fax machine, and both printing and copying speeds are slow. Maximum copy speed is 5 cpm, while the maximum printing rate is 6 ppm. However, with low running costs and splendid prints on any paper type, the Kodak ESPC310 is still a great buy for the home user.